Index on a virtual column: would it help others? Is it possible to create an index on a column a and use it for column b? In certain situations yes. I have a predicate on ord_date. I have a virtual column based on ord_date. What do you think if I create an index on the virtual column? Would it help my above query? What I have shown up to now is: If you create an index on a virtual column, and you use a where clause on the column on which the virtual column is based on, the index is selected by the CBO. But the question is: would this be extensible to all types of virtual columns? The index on the virtual column has been again used to cover a predicate on its underlying column. Let’s test another case with ceil function this time. Another case with abs function this time. The index on these virtual columns has not been used by the CBO. Summary: In all cases of functions I have used to generate the virtual column, the only function that has permitted to an index created on its generated virtual column to be selected by the CBO (when this virtual column is not in the predicate part) is the trunc function. Do you know why the trunc function works differently here? Very recently a question came up on oracle-list where the original poster was wondering about two things (a) how could a refresh on materialized view allows duplicate key to be possible in the presence of a unique index and (b) he was struggling about a particular select which is giving a wrong results. The answer to the first question is easy and I have already blogged about it. He was refreshing the materialized view using a FALSE value for the parameter atomic refresh. With this particular refresh parameter, the materialized view is refreshed using a rapid truncate table followed by a direct path insert. Direct path load as shown in my blog, will silently disable the unique index allowing duplicate keys to be accepted. Thought that this seems to be true (in this context of materialized view refresh) only in 11gR2. The preceding release (10gR2) is not allowing duplicate keys during this kind of refresh as I’ve shown in my answer in the oracle-list forum. Does this mean that 10gR2 is not direct path loading when atomic refresh is set to FALSE? I have to check. Load completed - logical record count 3. What do you think it happens to the unique index and to the table b after this direct path load? The unique index has been disabled and there are duplicate keys in table b. The CBO knows that there is a unique index on b(id). And, as far as there is one id in table a, the CBO, obviously, assumes that there will be only one record for the corresponding id in table b. This is why table b is not present in the execution plan by the way. Unfortunately the unique index has been disabled by the direct path load and has permitted the presence of duplicate record in table b. This is the reason why the query is producing a wrong result. It is clear that the CBO is not looking the unique index status during the optimization (plan generation) phase. But, what if instead of the unusable unique index, we have a disabled unique constraint? Will the CBO consider the status of the unique constraint in this case? Oups. The CBO is still wrong. What if we drop the culprit index? Which finally gives a correct result. Bottom line: always make sure your unique indexes are usable. 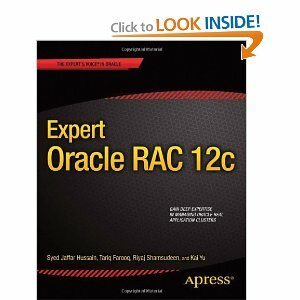 When Syed Jaafar Oracle ACE Director and one of the world RAC experts asked me to review the new book Oracle Expert Oracle RAC 12c he has coauthored with 3 other Oracle ACE Directors, my first thought was: how a non experienced RAC developer could seriously review this book? In my last decade of Oracle single Instance DBA-Developer carrier, I have got the feeling that Jonathan Lewis books (plus Tom Kyte and Christian Antognini ones) have let no place for other books ; at least in what those books deal about. In addition, Jonathan has a style of writing and narrating technical features that makes you feeling as if you are reading an agreeable story. I am still waiting to read as attractive and as elegant books as those written by Jonathan Lewis. Although I might not have any RAC experience, I finally decided to start reviewing this book more like a typical reader who knew the single instance fundamentals and wanted to learn basics of RAC. I know that I am very severe in judging the writing style of books (even in English which isn’t my mother tongue) and this is on what I was going to strengthen my attention. The first thing I did is to go through the Table of content and isolate Chapters that might be close to my background. The Chapters I have selected for review was then 6, 10, 11 and 12. Unintentionally, those Chapters belong to Riyaj Shamsudeen. Then I started reading Chapter 8 Backup and Recovery in RAC written by Syed. I couldn’t resist the temptation to write the current review before finishing reading the complete book. Chapter 6: Application Design Issues: I am very pleased to say that I have been agreeably surprised by Riyaj style of writing. He goes to the essential using concise words touching the heart of his desired goal (what he wants to explain). Although the design issues he presented can be found in several other trusted documents and blog articles, it is nevertheless worth having them listed all over in a dedicated chapter and in an elegant writing style; and among all of that, Riyaj has presented these issues always with a comparison between the effect these issues have on single instance and the magnified effect they can have in RAC. We have had a discussion about Localized Inserts and globally hash partitioning them to reduce the contention on the index. About excessive Commits, Sequence Cache, Index Design, Excessive Parallel Scans and Full Table Scans which you have already guessed are the main application design you should absolutely be aware of before embarking into a RAC project. Definitely this Chapter is a must to have Chapter for RAC (and even single Instance) designer. When you read this (red is mine): “In a single instance, a database block can reside only in the local buffer cache. Therefore, if the block is not in the local buffer cache, it is read from the disk. In RAC, the block can be resident in any buffer cache. So, a special type of processing takes place that deviates sharply from single-instance processing” and you know the fundamental work Oracle has to do to guaranty the ACID in single instance then you may realize how the task could be complicated in RAC. Riyaj ”simplifies” this for you. He has clearly explained this concept and showed how a consistent read is fabricated and how a Current Block read is requested and got in RAC. If you read this Chapter and Chapter 2 (Chapter 2 Redo and Undo) of the last Jonathan Lewis book then you will be sure that you’ve made your Redo and Undo Internal “Giro” or “tour de France”. Chapter 11: Locks and Deadlocks: In the process of reviewing this book I was very impatient to start reading this chapter. Because I am a big fan of Locks and Deadlocks and I have read everything about these two subjects. Although I can read and interpret easily a single instance deadlock graph I am unable to correctly interpret a deadlock graph from a RAC machine. Riyaj, as far as I am aware, is the first author who has published something about deadlock in RAC. I told him that I would have highly appreciate if he went into one or two real life RAC deadlock graphs and explained them in details in this chapter. Because practical cases are what readers want to see and what they most appreciate. Chapter 12: Parallel Query in RAC: Having no real experience in this particular subject, I read it as someone who wanted to learn how parallel Query is handled in a RAC machine. I will certainly keep this Chapter very close to me and will couple it to the work (blog articles and webinars) done by Randolph Geist and recent articles written by Jonathan Lewis to definitely master the parallel query in both single instance and RAC. As always, my experience let me know that sometimes I read a chapter (for example Chapter 2 Redo and Undo of Jonathan Lewis) that I found very difficult to understand. But when I worked hard to understand it (and it took me several months), I magically discovered how much this Chapter is well written and strictly speaking is wonderful. I have a feeling that it will be the same story with Riyaj Chapter 12. However, the above select doesn’t mean that there isn’t any other uniqueness enforcement implemented without a dedicated unique constraint. For each couple of (col1, col2) I could have at most a unique record for a not null dv_load_end_date column. Is this doable via a unique constraint? No it is not. I would not have written the first SQL in order to restrict the updates only to records in t1 having identical id1 and n1. I would have logically issued the second one instead. The same plan hash value and the same predicate part. It’s funny enough.